South of Vista Las Palmas and bordered by downtown Palm Springs and the San Jacinto mountains, the famed Palm Springs Tennis Club neighborhood was called home by the likes of Lucille Ball, Errol Flynn, and Frank Sinatra back in the day. More than 25 trendy and boutique hotels and inns lure today’s famous trendsetters. One of the oldest neighborhoods in the city, it is home to 11 structures on the historical registry including one of the first churches in the area as well as it’s namesake, the Palm Springs Tennis Club, circa 1940. Named for a well that was dug in the early 1900s, Deepwell was home various orchards and crops as well as the Deep Well Guest Ranch which was built around 1930. The acreage was subdivided and streets and homes began to take shape in the early 1950s. Famed architects including E. Stewart Williams, Donald Wexler and Hugh Kaptur designed homes eventually occupied by the stars of the day such as William Holden, Loretta Young, Jerry Lewis and Carmen Miranda. The area includes over 350 homes and is located in the southern area of the city bordered by Sunrise, Mesquite and E Palm Canyon. With the luxurious El Mirador as its centerpiece, the Movie Colony was developed in the 1930s and 1940s. In this tranquil neighborhood lived some of Hollywood’s biggest stars such as Cary Grant, Dinah Shore, Van Johnson, Tony Curtis, Gloria Swanson, and Jack Benny. Frank Sinatra made it “his” neighborhood in the 1950s when his home, known as "Twin Palms," became “party central.” One of the celebrity estates here was called the “Desert Royal Palace” because so many Europeans with royal titles and Hollywood elite were guests there. Some of our most renowned Modernist architects designed homes in this charming and prestigious area including E. Stewart Williams, William Cody, and Donald Wexler. It is home to iconic architecture of the Spanish Colonial Revival style as well as the Mid-Century Modernism style. This tour affords a visual feast of residences of Hollywood Royalty and unique architecture. Two of Palm Springs most historically significant neighborhoods, Old Las Palmas and Vista Las Palmas, are located in the northwest area of the city and attract those who want to own a piece of legendary Palm Springs history. 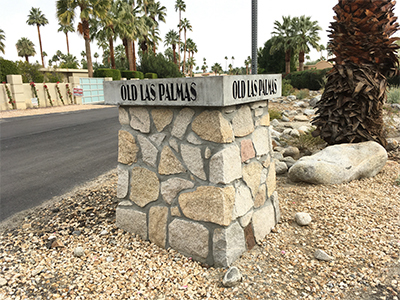 Arguably one of Palm Springs most prestigious and historic neighborhood, Old Las Palmas was originally a citrus grove and began its development in the late 1920s and 30s. It is located just west of Palm Canyon and south of Vista Chino. This ‘Playground to the Stars’ has had an impressive list of residents, including Gene Autry, Kirk Douglas, Judy Garland, Cary Grant, Katherine Hepburn and Lena Horne. And one of today’s biggest names owns the former Dinah Shore residence … Leonardo DeCaprio. 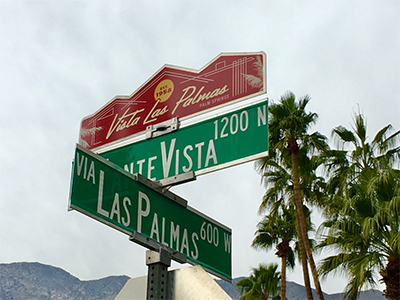 Just behind Old Las Palmas is the popular mid-century neighborhood of Vista Las Palmas with a majority of homes designed by notable architects Daniel Palmer and William Krisel and built by the famed Alexander construction company. In addition, the famous ‘Swiss Miss’ style A-frame homes designed by Charles Dubois are also dispersed throughout the neighborhood. This area also become home of many celebrities as the modernist design took hold, including Barry Manilow, Kim Novak, Elivs Presley and Debbie Reynolds. It is also the location of the architecturally significant Kaufmann House, designed by Richard Neutra in 1946. Kaufmann was a Pittsburg department store executive who later commissioned Frank Lloyd Wright to Falling Water in Pennsylvania. Contact William Landesman at 760-898-0274 for more information and available listings in these historic neighborhoods. William began his real estate career in 2008 in New Jersey’s famed horse country of the Somerset Hills. 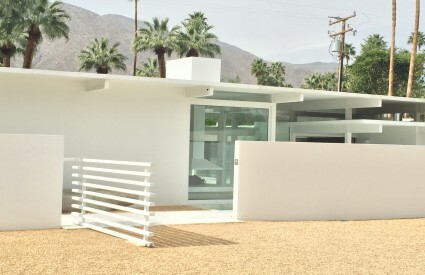 Prior to calling an architecturally-significant Palmer and Krisel 1963 development his Palm Springs home, William visited the Coachella Valley numerous times and immediately fell for the landscape, vibe and lifestyle the desert has to offer. William works with buyers and sellers throughout the desert cities, specializing in the communities of Palm Springs, Ranch Mirage, Palm Desert, Indian Wells and La Quinta.